« A vegan, 2 omnivores, and 30 days raw. Today, i woke up feeling icky. This is not surprising giving that i have been sick for a few days with an icky cold thing that has settled quite comfortably (for it) into my lungs. My sister and i took our 1st day measurements, and started then i made the first round of smoothies. I have been wanting to have more green smoothies in my diet, however, for the last couple days, food and I dont care for one another. I dont get sick eating, i just have no desire to eat. I skipped the smoothie part of breakfast. I made my family, carrot, pear, spinach smoothie. Originally, this was meant to be a juice, but i could not get to strain right (my nut bad milks are still in the mail), so it turned into a smoothie. Lindsay very nicely informed me that, this sorry excuse for smoothie, sucked. Lucky, my second smoothie, green and red apple – strawberry – kale, was significantly more palatable. My mom liked both smoothies, my sister strongly favored the later. I did not try either of them. A couple hours later Lindsay got the munchies. I stuck with water. Around noon, i got a little hungry, a couple plums satisfied me quite well. For lunch, we had lettuce wraps. 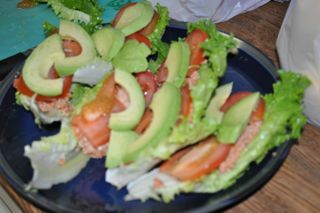 They did not seem to wrap so well, so it was more open faced salad consisting of green leaf lettuce, tomato, cucumber, and guacamole (avocado, red onion, jalapeno, cilantro, lime, and salt). Snack was a couple very tasty bananas. Then i started making dinner. 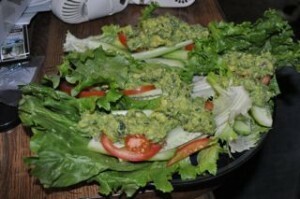 Dinner was a recipe from 12 Steps to Raw Foods called Live Garden Burgers. It felt alot like having another salad. 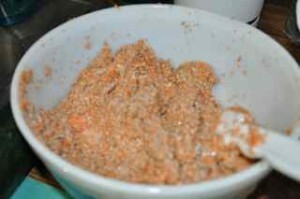 This is the seed, carrot, onion, speices mix that is between all those veggies. My mom really really enjoyed this recipe. I thought it was ok. A little less onion and i would have liked it better. Next time, less onion, and I need to find a way to make a raw bread thing without a dehydrator. After dinner, I sliced up a couple kiwi for each person. That was a great way to end the first day. I am definitely getting more kiwi. I came in around 1200 calories for the day. I am not trying to reduce my caloric intake, i am just not hungry. Today, i am still not feeling well, my energy is pretty good considering i feel like crap. The food was slightly time consuming simply because there is so much of it to make and almost every recipe is new. There was one period today of about 10 minutes where i really wanted something heavier like black beans and brown rice with pico, but i moved managed to over come that reasonably well but focusing my energy else where. We will see if that tactic holds up in the long haul. Well, i am off to bed. Lindsay, has been nice enough to tell you about her experience today. The detox hit more harder and sooner than I anticipated. However, what I don’t know if my not feeling well is only because of the diet change, or if there were other factors at play (I’ve had increased stress in my life and been exposed to a rather nasty cold.). It also didn’t dawn on me until today that my usual pain reliever is not raw-food, so at this point I am left to coast through feeling yucky. I will say that when Adrienne and I did measurements and pictures this morning, it was an eye opener as to the extent of some of my physical conditions. I’m looking forward to seeing them improve. 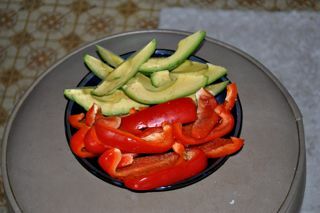 Also, I got to have a yummy snack before that I’d never had before – avocado and red bell pepper. Sliced red bell pepper is a usual snack for me, but I’ve never had it with avocado. I’m off to bed a bit earlier than usual tonight…I hope that sleep with help me feel better. This entry was posted on Monday, March 2nd, 2009 at 3:01 am	and is filed under Raw Food. You can follow any responses to this entry through the RSS 2.0 feed. You can leave a response, or trackback from your own site. There was one period today of about 10 minutes where i really wanted something heavier like black beans and brown rice with pico, but i moved managed to over come that reasonably well but focusing my energy else where. What about eating some some bananas then? Bananas satisfy me when I’m in the mood for something heavy on the stomach. You are welcome Seeker! Thanks for the comment. That is exactly what i did, i had a couple bananas and 5 or so nuts. It felt like the bananas did more then the nuts, but i did do them together, so i dont know for sure which on of the combo did it. Ah. I’ve started eating nuts too this week and it fills me as well. Tonight I didn’t feel like going home to eat dinner, but I was hungry, so I ate some nuts and it kept me filled. I just couldnt leave from your blog post before telling which i certainly loved the quality information that you offer to your visitors… Might be returning often to check up on new stuff you report! Thanks Randy. I am glad you enjoyed it. There is alot more to come with regards to raw food and juicing.